Johnstown, Pa - The St. Nicholas Serbian Orthodox Church in Johnstown , Pennsylvania hosted the Deanery Lenten Vespers on Sunday, March 21, 2010. Host priest Fr. Dejan Obradovic, Very Reverend Stavrofor Dragoljub Malich from Monroeville , and Father Miladin Blagojevic from Yungwood, officiated. The St. Nicholas Choir of Johnstown sang the responses under the direction of Suzette Gardenhour. Very Reverend Stavrofor Dragoljub Malich gave a very nice sermon. 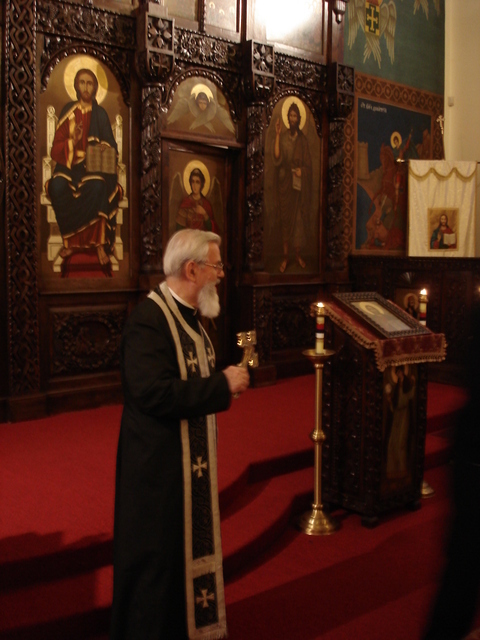 Following Vespers, the faithful went to the church hall for a dinner prepared by the members of St. Nicholas Church. Executive Board President Eli Cvijanovich warmly welcomed all in attendance and expressed appreciation for everyone coming. He thanked Father Dragoljub Malich for his beautiful homily that he delivered in the church and the choir who sang the responses as well as the members who prepared a wonderful dinner. Thanks be to God for this blessed evening.